Compare pricing for limo service in Boca Raton, FL. Car service, transportation and limo rentals near Boca Raton. Price4Limo has over 12,000 vehicles in our inventory with photos and prices for you to choose for your transportation needs. Getting a free quote takes less than 30 seconds and no email is required! Limo Service Boca Raton, FL. Boca Raton to Palm Beach Airport will have you riding in a variety of vehicles on our website Price 4 Limo. Get a quote within seconds as you choose from a library of vehicles for hire. From Boca Raton to Palm Beach Airport ride in style in one of our charter buses, limousines, or car services to anywhere in Palm Beach County, FL. If you are celebrating a birthday, honeymoon, or corporate event our vehicle service will be there to pick you up from Palm Beach International Airport to Boca Raton and take you to your destination with our chauffeur service that is tough to match. 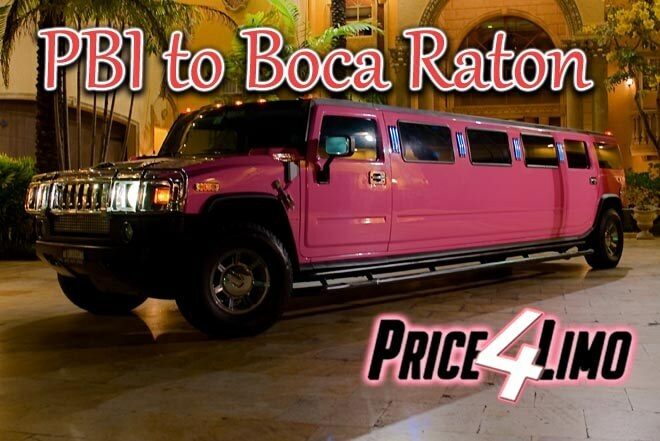 Preview Boca Raton Party Bus and Limo Fleet. Boca Raton to Palm Beach Airport can pick you up in one of our available charter buses that can be found on our website. Start off by checking out our 14 passenger limo bus that has leather interior and is great for a small group traveling or family heading on their vacation. If you are going to be involved in a corporate retreat or in a local tournament your crowd might surpass the limo bus limit but that is ok. We provide you with a solution where you can ride in our mini bus that sits between 20-32 passenger. When it comes to tournaments a lot of times you are going to be rolling with the whole team or if you are heading for modeling shoot. Our coach bus can sit up to 50 passengers and make it to any hotel located in Boca Raton. As you ride in our larger charter buses enjoy the surround sound system and watch a movie on the large LCD screen TV while we drive down Interstate 95 to your destination. Make your ride from Boca Raton to Palm Beach International Airport one of legends. Ride in style with one of our luxury limousines. You can choose from our large selection online such as our Pink Hummer Limo, Chrysler 300, or Cadillac limousine just to name a few. Reserve one of our limos and enjoy the ride as you celebrate your honeymoon or anniversary. 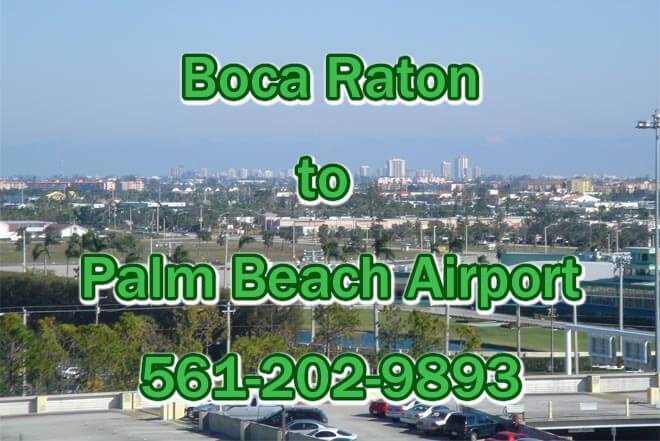 Boca Raton to Palm Beach Airport will have you riding like a celebrity as we take you and your loved ones on a fun ride down I-95 to the airport. Our town car service is a good substitute to take you from Palm Beach Airport to Boca Raton or from Boca Raton to Palm Beach Airport. With our sedan service we provide a chauffeur service that is professional from start to finish. Reserve us for a few hours and before you head out let us take you out to dinner so you can enjoy a nice meal before you get on that flight. You won't be able to get that kind of additional service when you reserve with one of the yellow cab companies. It's only a one way trip and if your flight is late in the afternoon and you have checkout at noon from the hotel at Boca Raton you don't want to be hanging out at the airport for a long period of time. Boca Raton to Palm Beach Airport provides you with a multitude of transportation services through our website Price for Limo. Within a few seconds you can decide if you want to be riding in a limo, shuttle service, or car service. 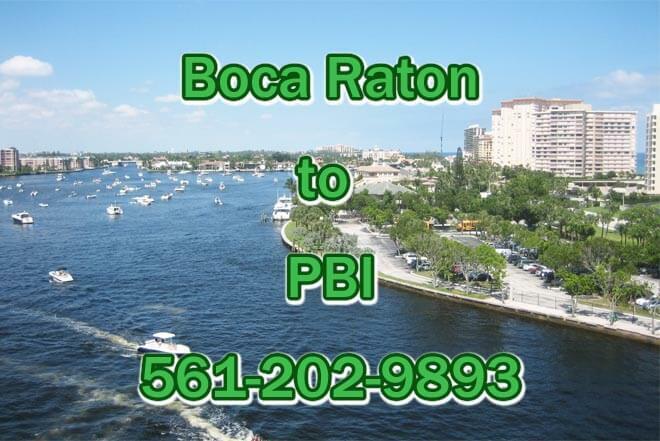 Boca Raton to PBI can have you riding comfortably as we take you to the airport so you can catch your flight on time and not have to worry about not making it to the gate on time. When you land we have you covered, from Palm Beach International Airport to Boca Raton we can take you to a hotel near the beach on Boca Raton or straight home so you can relax and be with your friends and family.